Diverse Lewisham is popular with young families and professionals priced out of central London. Rentify can help you make the most of your letting with our handy borough guide. At Rentify we have property specialists dedicated to Lewisham, armed with local expertise and unmatched valuation knowledge to find you the right tenants. The London Borough of Lewisham is one of the most diverse boroughs in London, which is reflected in the variety of districts it contains. Quaint Blackheath attracts families with its chic boutiques, open green spaces and village feel. Leafy Forest Hill is home to the much-loved Horniman Museum, which houses a large collection of anthropological artefacts and offers spectacular views across London. Urban New Cross attracts a creative crowd owing to Goldsmiths University being located there, and estate agents are hailing it as “the new Shoreditch”. No tube lines run through Lewisham, however it is well served by London Overground and the DLR, as well as numerous mainline rail services connecting commuters to stations such as London Bridge and Victoria. Around 70% of Lewisham housing stock comprises of flats, followed by terraced houses at 18%. Property styles range from Victorian terraced to modern new build accommodation. 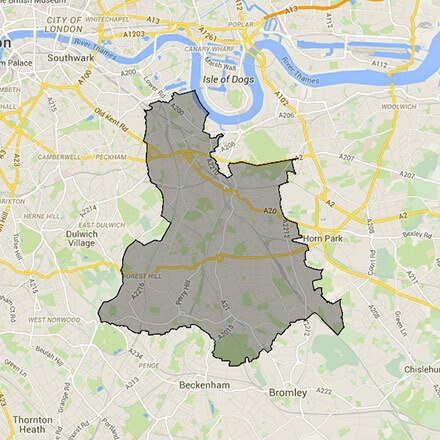 Lewisham's many districts each have their own character, catering to a variety of residents. Here's our top picks for new landlords in the area. This borough covers the BR1, BR3, SE10, SE12, SE13, SE14, SE15, SE16, SE19, SE23, SE26, SE3, SE4, SE6, SE8 and SE9 postcodes. Rentify uses proprietary methodology for data collection and processing. Borough data is collected from Rentify's property database and external public sources.